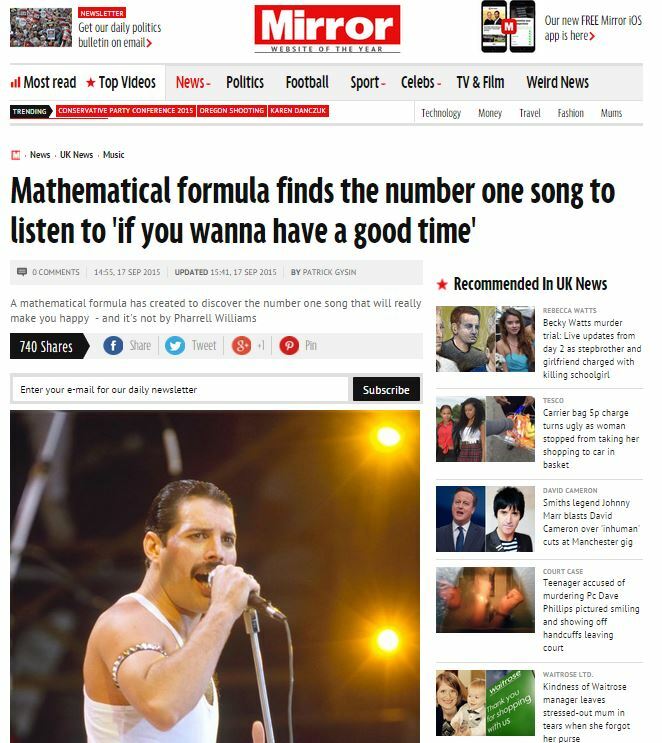 A mathematical formula has been created to discover the number one song that will really make you happy – and it’s not by Pharrell Williams. 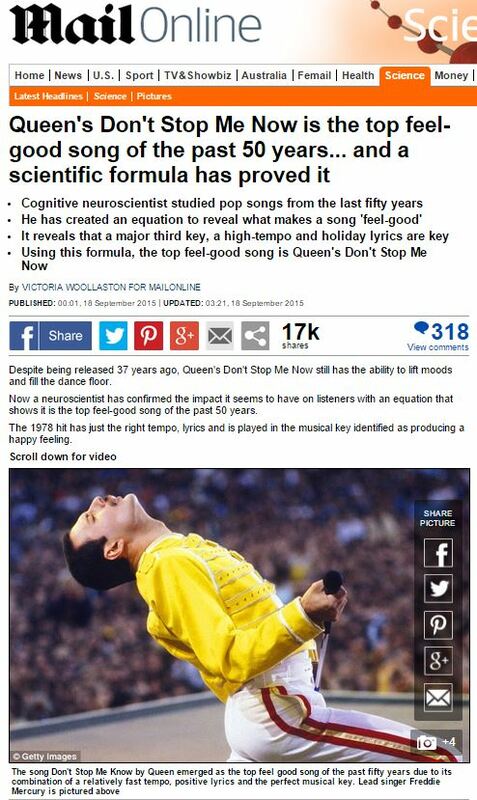 Queen’s hit, Don’t Stop Me Now, topped the charts after expert in cognitive neuroscience and emotion, Dr Jacob Jolij, sifted through 126 songs from the last 50 years. Despite being released 37 years ago, Queen’s Don’t Stop Me Now still has the ability to lift moods and fill the dance floor. Now a neuroscientist has confirmed the impact it seems to have on listeners with an equation that shows it is the top feel-good song of the past 50 years. The 1978 hit has just the right tempo, lyrics and is played in the musical key identified as producing a happy feeling. Good old scientists – always working on the important stuff, right? Isn’t it amazing that a university would pay a professional scientist with public funds to spend all his time putting together formulae for things like pop songs? Isn’t that what science is all about and why so many people think it’s not something they should value? Dr Jolij concocted the formula in a project with technology brand Alba, whose products are sold by Argos. A survey by Alba found three quarters of people in Britain use music to lift their mood and 54 per cent use it to motivate themselves. So in essence, a song is a ‘feel good’ song if the lyrics are universally positive, if it has a reasonably fast tempo and if it isn’t in a minor key. I’d be astonished if those were findings that were lead by the ‘research’, rather than a conclusion outlined ahead of time which had a formula clunkily retro-fitted to it to make it seem impressive. Each time a scientist accepts a commission from a PR company to create spurious research in order to push a product, a little of the legitimacy and public trust in science as a whole is cashed in. For my money, it’s a waste. This entry was posted in Alba and tagged Alastair Chalmers, alba, daily mail, formulae, Jacob Jolij, mirror, Patrick Gysin, victoria woolaston on October 20, 2015 by Michael Marshall.